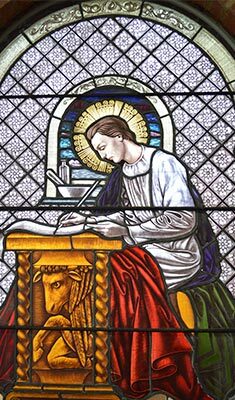 Saint Luke lived in the First Century A.D. He was a physician, companion to Saint Paul (with whom he travelled and preached) and Christian historian. His name is believed by some to be an abbreviation of Lucanus. Luke was the author of the Acts of the Apostles and the Gospel According to Luke (sometimes referred to as the "Third Gospel"). It is thought that Luke may have been a native of Antioch in Syria, but Greek in birth and education. Some authorities believe he may have been a Roman citizen. When Luke met Paul, he had already converted to Christianity. Luke learned much about Jesus and Christianity from Paul and soon became well-versed in Jewish history and customs. Luke wrote his gospel around 60 A.D. and composed Acts approximately three years later. For his gospel account, Luke garnered his information from eye-witnesses and documents. Since Luke is believed to have been with Paul when the latter was imprisoned at Rome, it appears likely that he would have met the apostles and disciples, and would have been aware of the gospels written by Mark and Matthew. It is widely held that one of the people Luke interviewed... perhaps at greater length than any other witness... may have been Mary, the Mother of Jesus Christ. Luke travelled with Paul on visits to Antioch, Caesarea and Jerusalem. While Paul was detained in Caesarea for two years, Luke began to put together a history of Christianity. During Paul's first imprisonment at Rome, Luke completed his two volume history. Shortly after attaining the age of 50, Luke accompanied Paul on the second missionary journey and, at approximately 57 years of age, he joined Paul again at Philippi to embark upon a third voyage, completing the trip in Jerusalem. Luke, referred to by Paul as the "Beloved Physician," has rightly been called the first Christian historian. He was the only Gentile (non-Jewish) writer of the New Testament. in contrast to either the gospels of Mark or Matthew, Luke's gospel is clearly written more for a gentile audience.